A major row is brewing over plans by a US millionaire to build a golf course on a precious wildlife site in northeast Scotland – but this time it’s not Donald Trump, it’s his business rival. Mike Keiser, a wealthy businessman behind some of the most prized golf courses in the world, now wants to build one at Coul links, on the coast to north of the Dornoch Firth near the village of Embo. 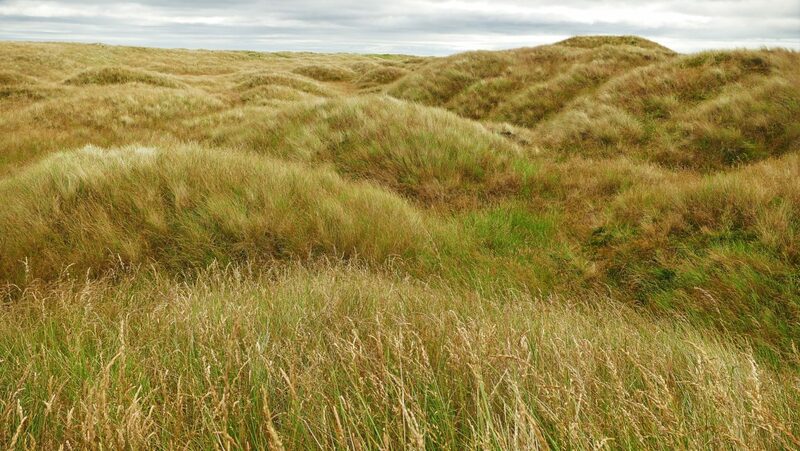 In so doing he will trash a highly protected network of sand dunes treasured for birds, insects and plants just as Trump destroyed the dunes at Menie round the Aberdeenshire coast, experts say. Conservation and community groups are gearing up for another epic battle with a powerful American tycoon. “It’s the Trump golf fiasco all over again ,” said one. Keiser, famed for his high-ranking Bandon Dunes golf courses in Oregon, was last year labelled as “Trump’s biggest rival in the golf business” by US Fortune magazine. He has teamed up with a US banker and entrepreneur, Todd Warnock, who already owns property in Dornoch, to develop Coul links. They have submitted an application notice to Highland Council, and are now preparing to apply for detailed planning permission. Their 18-hole championship golf course will attract 20,000 visitors a year and put over £6 million a year into the Highland economy, they say. But it is facing angry and concerted opposition. Dr Tom Dargie, a leading dune expert commissioned but then ignored by Trump at Menie, says that Keiser’s proposal will be much more damaging. He estimates that a golf course at Coul will destroy 48 hectares of the Loch Fleet sand dune Site of Special Scientific Interest (SSSI). This is more than double the area damaged by Trump’s course. Coul is also part of a special protection area for birds with, teal, wigeon, plovers, and terns. It is home to an array of rare moths, ants and flies, probably including Fonseca’s seed fly which only lives on that stretch of coast. Jonathan Hughes, the chief executive of the Scottish Wildlife Trust, lived and worked at Coul in the 1990s. “Like Trump, Keiser has a track record of getting his own way whatever it takes and like Trump, he seems to think protected area laws can be torn up for his own private financial gain,” he said. The Royal Society for the Protection of Birds (RSPB) described the plan for Coul as “extremely worrying”. The developer had refused to meet with the society and other conservation groups, it said. “This is highly unusual and cause for great concern, especially since Scotland has a very poor recent track record dealing with high-profile international golf developers,” argued RSPB Scotland’s planning chief, Aedán Smith. Craig Macadam from the insect conservation group Buglife, promised to fight the development. “A golf course can be sited anywhere, but many of the species found at Coul are completely reliant on these fragile habitats,” he said. The government wildlife agency, Scottish Natural Heritage, is awaiting further studies before deciding its stance. Conservationists expect it to object. A spokesman for the developers’ agent, the property company JLL, stressed that plans were still at an early stage. Criticisms from conservationists were “therefore without foundation”, he argued. Keiser and his designers were “world renowned experts in golf course design and construction methods which seek to enhance and preserve the natural environment,” he said. Photo thanks to Mark Foxwell, Scottish Wildlife Trust. A version of this article was published in the Sunday Herald on 21 August 2016.